As promised, let me share with you the continuation of my birthday celebration, highlighting on how we had fun without spending. Not until last year, when I was pregnant that I started betting on my luck without shelling out any cents. It started when I got hooked on the internet browsing for answers to my questions on pregnancy, breastfeeding, and parenting and that includes reading real life experiences of mommy bloggers. Then the whole blog giveaway thing just became my addiction. But I also screen out and choose to join only the more reliable online contests. I had won a number of giveaways lately, just in time for my birthday. And because my free treats couldn't be used up all at the same time in one day, I've extended my celebration to day two. Exactly a month before my birthday, I received a message from AllPromos.ph that I have won on their Daddy, Mommy and Baby Photo Contest. I randomly joined their contest two months ago without expecting to win because first off, I hate to join liking contest and secondly, they have a lot of entries, more than a hundred, and I'm just one of them. Good thing they have another criteria where my photo entry was included in the top 12 judge picks and from the 12, I won the random raffle draw. How lucky am I? And the prize package was quite generous. Aug. 24, 2013. 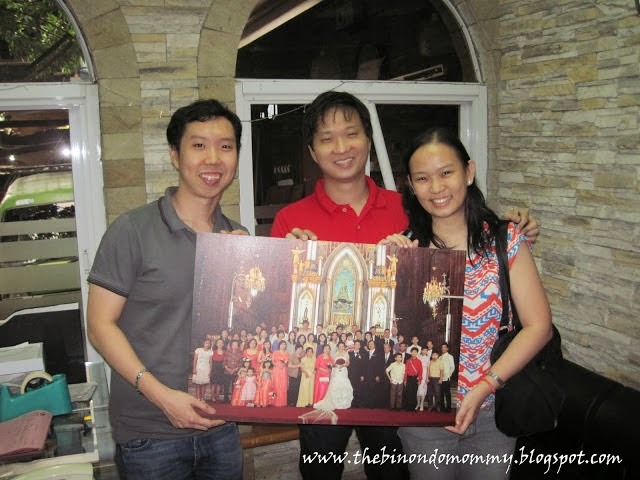 Photo op with the owner of Print and Mount Portraits, Alvin. Every year during my birthday, I would always remind myself to visit Q Power Station. Why? Because I have to claim my P200 free credits to be loaded in my﻿﻿ VIP Q Card. The free birthday load can be claimed within three days before or after your birthdate. When I checked my balance, I have already 844 credits, which means I have been claiming my free load for four years already. Actually five years already because I have been a Q Card holder since 2008. It allowed me and my hubby to unwind for a while, shot a few hoops, and be on our childish mode after so long. The last time we played was when we were still single I think. I immediately exchanged the few tickets we won for some small prizes because I don't know when we'll be able to have the time to play again. Aug. 24, 2013 at Q Power Station Rockwell. Claimed my free P200 birthday load. 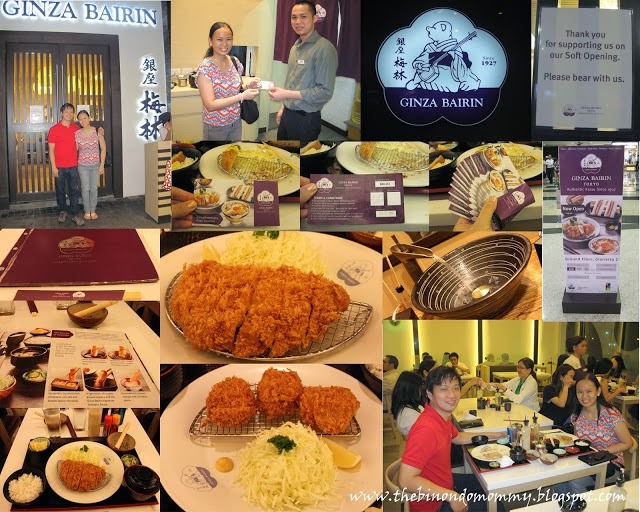 And since we were already in Makati area, we dropped by Glorietta 2 to claim my P1,000 Gift Certificates at Ginza Bairin which I won from Shoot First, Eat Later blog giveaway just two weeks ago. That served as my birthday dinner date with my hubby. I ordered their best seller Kurobuta Rosu Katsu Set worth P595 and hubby tried Hire Katsu Set (3 Fillets) priced at P345. Of course mine was more mouth-watering. And because we were not familiar with Makati malls, it took us a few rounds before we were able to find the restaurant. The place is along the street (Palm Drive) and beside Wee Nam Kee. Hubby was surprised to see me consume three bowls of rice. Good thing their rice is unlimited. Breastfeeding momma got so hungry after a half day of adventure. Aug. 24, 2013 at Ginza Bairin in Glorietta 2. It was a tiring day for both of us but we really had fun because we were able to play and eat without spending, except for the parking. If I didn't win these free treats, I might not be able to take part in the talk of the town, the katsu craze. Thanks to AllPromos.ph, to Print and Mount Portraits, to Q Power Station, Shoot First Eat Later, to Ginza Bairin and to my hubby for accompanying me to celebrate my birthday. Although these treats are not really the things that I urgently need or a must-haves, I'm still thankful for whatever blessings that I got. It's my luck after all. And the only thing I could do to pay it forward is to share my wins to you through this post. If you happen to be interested in the services of Print and Mount Portraits, I would appreciate it if you tell them that you read it from my blog. And if you still have a child-at-heart, you may want to get a Q Card too so that you have something to look forward to on your birthday. And if you want to join the katsu craze, have your authentic katsu at Ginza Bairin.